Our diverse, unbiased responders will tell you which cover art they like best — and why. Test market your book covers quickly and privately with our unbiased audience. I chose option "B" because the title of the book is more unique and thought provoking. The description gives me a good idea what this book is about and what I can get out of it. The image on the front cover of the book is more appealing in comparison the the image for option "A". I like B because I'm more interested in knowing how people manipulate others so I can avoid being manipulated. The topic of option A doesn't appeal to me in the least, although there's probably a market for it. It sounds like it involves being mean, cheating, etc. I think B is the more intriguing title and the subtitle also gives the reader a much better idea about what the book will be about. I think A is just kind of confusing and doesn't really get the author's intention across well. Personally, I wouldn't buy a book that was a "Ruthless Guide to What [I] Want." It sounds manipulative (and I know, that's the point!). But honestly, the subtitle "Understanding the Dark Arts..." is more... acceptable. This to me means that you are helping you self become successful by stacking the deck in your favor. I dont think that you need to manipulate people, You just need to be able to one up them. I think the main title would be more attention getting to the intended audience. The Devil's Playbook could turn some people off or give them the wrong idea of what the book is about. First of all, I like the color. It's more eye catching. Second of all, I like how the figure is walking on a path. The figure on option B appears to be at the end of a road, almost as if he is walking into the ocean. It's much more foreboding, where as choice A is much more of a hopeful look. I would pick choice B because I positioning of the words better. The title at the top with the tagline description directly underneath and lastly the authors name at the bottom. That puts everything in order for me to see this cover and make a choice on purchase. I feel like this discusses more than what meets the eye. It makes me want to jump feet forward into something and leaves an aura of mystery surrounding itself. I feel like the main message is conveyed. the image of the beach is much more appealing and would be a goal for someone looking at the nomadic lifestyle while the other image seems like someone trudging through a desert. I choose A because I like the idea of the person walking a path to unlocking the secrets of being a vagabond in the graphic. I also like the orange color, it catches the eye. This is the better choice, A, because the design is more neutral and attention grabbing. It peaks my interest and is not over powered by one line or another. I like the colors used and the tearing of the page to reveal a traveling man. I like choice B with the orange background and man in the path better. Though, I do think both will work well. Just seems that choice B is more attention grabbing for a book cover and makes you more interested. I like the illustration of this cover better, the effected of the ripped page and how there is a person inside I think that it makes a better point since its like a glimpse to our the inside of our minds. This is a tough one as I think they are both well designed covers. I think Option B fits the title of the book much better. I think it displays the idea of a journey and exploration well. I like that this cover is more creative and looks like you are ripping open a package to reveal a secret. The cover makes me think that the book will be more creative as well. The guy in the pic appears to be moving up, as in going in a more positive direction. The other has a long and winding road ahead of him, which is more negative in my opinion. Option B looks like one of those books they do throwback covers one, like Catcher in the Rye. If I saw that book in a book store I would assume it was an old book reprinted. Which book can teach you how to lead employees in your office? I feel like option B shows the "boss" looking the most confident and surrounded by other coworkers. Option C shows a similar scene, but because the man is not looking straight ahead, he appears more detached and pensive which doesn't make me feel that he is as authoritative. Option A's photo seems to not really relate to the main topic of the book. The man is completely alone, back turned, and looking into the distance, so I don't get the same strength from this image. Option B clearly gives me the strongest illustration of "leadership." A is better because the cover doesn't look goofy and it helps sets the tone of the book (someone looking for answers through a self-help book). Red is a better color than green (it emphasizes and gives more impact) and the pose of the man in front looks better for one fulfilling the role of a boss. The green man's pose looks like one you can't take seriously (due to his costume). C is the most dynamic visually. The boss on the cover looks powerful but not too much like a caricature. The red also indicates someone who is powerful and a leader. Choice B is too much like a cartoon character or superhero. Choice A is not at all exciting or passionate. It's too contemplative and doesn't indicate leadership. Option A has a very classy almost timeless book cover design. it looks like "Negative Self-Talk" and than you notice the "love your" art at the top. That's the only thing that's slightly off about this cover, the heart design looks nice and it helps get the books point across. I would definitely want to pick this book up in a store. Option B looks like a terrible women's self help novel, way too loud, the text is so big it's hard to understand what the title is, it's almost modern art it's so senseless. The other one honestly looks like it was thrown together in adobe illustrator, while this one looks like a real book you'd fine on a shelf. The formatting is good, and the graphic is a nice touch. I chose A because the other choice is not as appealing and its harder to read. Choice A has it where I can read in order instead of jumping all over the place to read the title. I like the book cover in choice A. More descriptive and a better use of the layout and whitespace. Good reviews also on the cover. Choice B seems to be screaming at you. Option B is much more visually appealing and relatable. The man in the image of Option A wouldn't fit in with most people's self view and would turn a number of people off on the book itself. Option B is more relatable and fits better with the topic and them of the book. Option B would get a wider audience of people interested and willing to pick the book up off the shelf and see what it has to offer. The little heart logo for "negative self-talk" looks very out of place on both covers. I chose B because with just a colored script it looks less out of place, but my ideal cover would be A, with the author's photo, WITHOUT the weird illustrated heart. To me, this cover has a warmer, more inviting illustration on it. The over cover has a very bright and almost jarring white background with dark colored lettering on it. Option A's softer hues are easy on the eyes. I think the font and layout pulls me in more. It looks like the book would be more interesting than Option A. It looks less clinical and like a potentially more light, potentially humorous read. It catches the attention better. in A, the author looks like a regular guy (of course) just like me. B is more mysterious and 'bigger' like it holds secrets that us regular guys dont' know. Which cover do you prefer for a book about balancing life as a working parent? I prefer the size of the text and the font for the phrase at the top, 'The Busy Mom's Guide To..." I don't like the larger graphic of A. It seems to emphasize the mother's legs too much. I also like the way the author's name is in B. (Thought I might add below the name what LMFT stand for.) I also don't like to orange-y color of the Title and author's name in A. And just noticed the phrase at the top is also in that color. And that font is smaller than in B.
I am choosing A because the image is bigger and therefore seems more important and I like that. I also like the orange font because it adds an additional element of character to the cover that choice B just doesn't have. I like the bigger font used on the top of the page and the black stands out so much better than the lighter color. Even though the picture isn't as big, the cover stands out much more than choice A.
I like the closer clearer image on the covee..I like the wording at the top..under that title better. Would grab my attention...make me pick this book up and see what it's about. The term "your" in the title (your house, your fire) imply ownership and responsibility. It infers that the book will provide guidance for what an individual can do to prevent fires. It suggests that by taking personal responsibility for "your" house, you can possibly prevent a fire that without following the advice in the book, may be "your" fault, and that seems helpful to me. It just sounds more professional and I like the layout of the pages better. From the Ash makes if seem like you are rebounding from something-- you're getting up from the ashes and starting again. The other makes it just seem negative where from the ash makes it sound like you're finding the good within the bad. The "Your" really drives home the fact that it could happen to you. It's not some abstract concept of a fire at some house, it's YOUR house. More attention-grabbing. Also, the "Special Edition" being larger than the rest of the text that follows really makes it stand out that there is added content. The title in option B scares me. I know it could happen to me, but I don't care to be reminded of that fact. Option A talks about the book being a guide to planning, protection, and recovery, which makes it more relevant to me and is not scary. 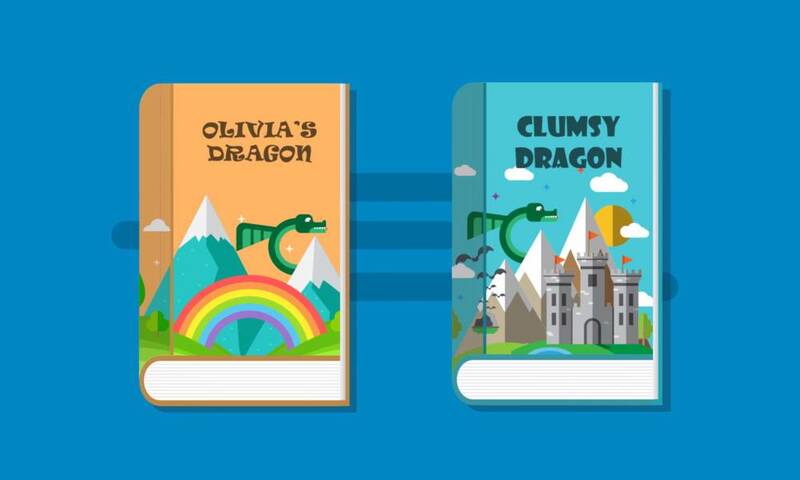 Which book layout and subtitle is more appealing? All the covers are very similar and not particularly appealing, but I prefer Option B because it references setting goals, not just achieving them. Personally, I think choosing goals strategically is just as important as achievement. In addition, the tag "best-selling author" is not all that telling since there are any number of lists an author could land on. Being a NYT best-selling author, for instance, is much more meaningful than being a Luxembourg's best of nonfiction self help by international authors best-seller. (I say this as someone who has worked with authors.) Overall, though, I can only rate all of them 2 stars because nothing about the cover or the subject matter is particularly attention-grabbing or compelling. It sounds and looks like yet another old white guy trying to tell people how to live. I prefer A for two reasons. One is that I feel like the word Achieved sounds more empowered than the words Setting and Getting, and I prefer A and C to B. That being said, I don't necessarily respond much to whether or not a book is a belt-seller, and I think that C has a more cluttered appearance than A does. So, given the purposes of the book---A is my favorite overall, then C, then B. How well do you like this cover for a sci-fi novel with a woman protagonist? Give a star rating and why. Five stars means you love it and so on. Overall I really like it! It draws you in and makes you very interested to learn what it's about. The only thing that throws me off a bit is the type inside the box, I wish the image, box and type were scaled and positioned so the type could have somewhat more consistent margins above and below the text, and more of a margin between the box and the text on the sides. I like the fact that the story has a woman in the lead role but this cover doesn't do anything to suggest the themes or subjects of the story. It just looks like stock photography. itdoesn't even suggest sci-fi. It could be a romance novel, a western, a period drama, anything. It needs a context for the image and additional visual clues. I don't get that this is a Sci-fi book by the cover alone. Though I have no issues with a woman protagonist or a woman on the cover, I feel that a full faced picture for the cover doesn't give me any hints as to what the book is about. It's okay, but not great. Really I wouldn't mind seeing this without the box. The box feels very out of place for it. The rest of it is nice, the face and expression on her face are good given the name of the book. It really depends whether it reflects the contents accurately, but I just have to assume it does. I like that the focus is the eyes + title. The photo doesn't seem good enough quality to print so large, though. Send an email to your friends and family with the different book covers and ask for their feedback. Create a Google Ad or Facebook Ad for all the different book covers and see which one has the highest click-through rate (CTR). PickFu gets you the same quantitative and unbiased results as buying expensive ads, but much faster and without any of the hassle of trying to figure out how to setup the ads. As a bonus, you get written qualitative feedback you can use to further iterate on your book covers. Armed with this data, you will have the confidence to choose the best book cover. 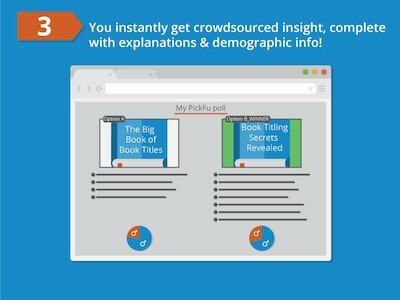 Why use PickFu to test your book covers? Just write one question and two answer options and your book cover poll is ready to go. Our respondents match US demographics, so you get balanced, unbiased results for your book cover. Keep iterating on your book cover throughout the day as you instantly get feedback you can use. Get an objective third-party point-of-view on your book cover. Learn the why behind each response and make better book cover decisions going forward. PickFu.com is my go-to tool whenever I want direct and honest feedback for my cover or book title. What I love is I get results within an hour and how the respondents provide a detailed 'reason why' they voted a certain way. 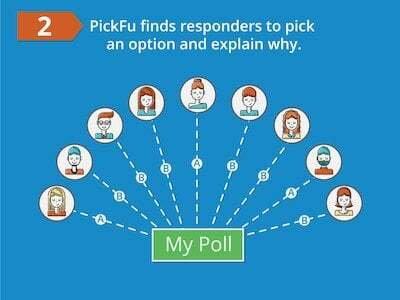 I selected PickFu because of the quality of the responses and the speed at which I received polling results. I simply don't have that patience or the luxury of waiting for days to receive polling data. I did multiple polls to help me select a new book cover and received the results of each poll in less than 15 minutes. Fantastic cost effective service and excellent support. I truly am a happy customer. What struck me the most was the quality and context of some of the comment responses. They will actually inform some choices as I move forward with this project. To be honest, I was *stunned* at the results of that poll. I really liked the cover image with the new picture, but the vast majority of people liked the original all-red one. Since the purpose of a cover is to grab eyeballs and interest shoppers to click, it really is a popularity contest. The majority ruled. 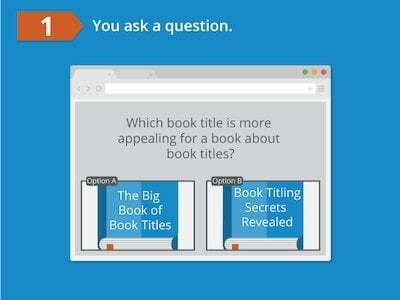 PickFu makes it incredibly easy for authors to test their book covers and titles. You can get results quickly since PickFu has an established testing audience, and survey respondents need to say why they made the selection they did — this way, you’ll know they didn’t arbitrarily choose one design over the other. I wanted to know which book cover design would entice a potential reader to buy my book. With PickFu, the results were timely, but more importantly, the comments I received were so thoughtful. Everyone's response provided additional insight.